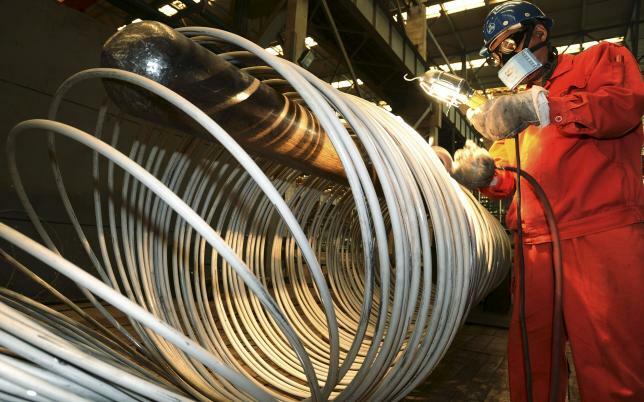 BEIJING – Activity in China’s factory sector unexpectedly shrank to a 6-1/2 year low in September, a private survey showed, raising fears of a sharper slowdown in the world’s second-largest economy that could spell more turmoil for financial markets. Global investors and policymakers are on edge over China after the U.S. central bank last week held off from raising interest rates, saying it was unsure if international problems, and China’s slowdown in particular, will hurt the U.S. recovery. The preliminary Caixin/Markit China Manufacturing Purchasing Managers’ Index (PMI) fell to 47.0 in September, the worst since March 2009 and below market expectations of 47.5 and August’s final 47.3. Levels below 50 signify a contraction. China’s factory activity has now shrunk for seven months in a row, and the latest survey showed conditions in September deteriorated from August by almost every measure, with companies cutting output, prices and jobs at a faster pace as orders fell. “The weaker-than-expected PMI suggested domestic and external demand remained sluggish. It’s almost certain China’s economic growth will slide below 7 percent in the second half of this year,” economists at Minsheng Securities said. Economists had expected the latest PMI to remain anaemic but edge up slightly, as a slew of stimulus measures since last year slowly take effect and as many factories which had closed in August and early September began to reopen. It’s no secret that China’s economy has been gradually slowing from a breakneck double-digit pace in past decades, as Beijing tries to transform its growth model from a reliance on heavy manufacturing and exports to one with a more vibrant services sector and stronger domestic demand. But persistently weak factory activity and cooling investment could spark fears that the downdraft is now too intense for services alone to offset, putting the economy at risk of a more profound cyclical and structural slowdown that could jeopardise the fragile global recovery. Factory output sank to its lowest since the global financial crisis, and soft orders suggested more weakness ahead. New orders, a proxy for both domestic and overseas demand, fell to a near four-year low while export orders shrank at the fastest clip since mid-2013, highlighting weak global demand. The China president of U.S. crane and mining equipment maker Terex Co (TEX.N) told Reuters on Monday that he expects half of the country’s machinery makers to close amid a four-year market downturn, though he remained optimistic for the longer-term. “Everyone thinks it’s a market that is declining, but it’s still growing. It’s declining growth,” Ken Lousberg said. The dismal PMI reading raises the chance that third-quarter economic growth could dip below 7 percent for the first time since the global crisis. Some market watchers believe current growth is already weaker than official data suggest. “The PMI’s new leg down is consistent with a further deceleration in Chinese growth through year-end 2015,” said economist Bill Adams at PNC Financial Services. The weak PMI will reinforce views that Beijing will roll out more support soon, including further cuts in interest rates and bank reserve requirements and higher infrastructure spending. “Patience may be needed for policies designed to promote stabilisation to demonstrate their effectiveness,” said He Fan, chief economist at Caixin Insight Group. Nomura expects one more 50 basis point (bps) cut in bank reserve requirements (RRR) in the fourth quarter, while RBC Capital Markets predicts another 25 bps interest rate cut and at least 50 bps in RRR cuts. While the factory sector looks set to remain weak for some time, there are mixed signals in other parts of the economy. The latest survey by China Beige Book International showed continued robust growth in the service sector in the third quarter, though some small companies elsewhere have told Reuters business has never been so bad. Home sales and prices are slowly recovering, but new construction starts are down nearly 17 percent from a year ago. China’s surprise yuan devaluation last month and a plunge in its stock markets since June have fuelled worries about more shocks to the economy, although Premier Li Keqiang has brushed off concerns it is facing a hard landing.